Extreme conditions differ depending upon where you are on the planet, what situations you’re facing and for how long. Someone surviving a harsh arctic blizzard will have very different survival needs compared to someone stranded in an arid desert, for example. Survival tech is therefore wide-ranging, from the seemingly humble packet of waterproof matches, through to an all-encompassing ‘bug out bag’ brimming with everything you need to wait out a storm or full-blown natural disaster. Here we’ve focused on high-tech survival kit that can be applied to a broad range of extreme conditions. Water, food, shelter, warmth and communication are high on the list of needs, so we’ve targeted tech to address those specifically. Do you know where you are? Have you been separated from your group? Getting caught in a storm, or straying into wild and unknown terrain, can be disorienting and scary. Having a durable GPS watch strapped to your wrist means you can avoid feelings of panic by being able to figure out exactly where you are. Casio’s rugged Rangeman survival watch has a built-in compass so you can use it to pinpoint your position and work out how to get back to base camp or the nearest town. The solar- and battery-powered Rangeman provides sunrise and sunset times, plus tide indications, which is handy for extreme conditions involving the ocean. There’s also a barometer alerting you to pressure changes in the atmosphere, indicating a possible incoming storm. Communication is key when it comes to surviving in extreme conditions, but your smartphone might not be up to the poor signal dictated by storms or off-the-grid locations. Garmin’s palm-sized satellite comms device aids your survival by helping you to message for help. The inReach Mini enables you to send and receive texts, to track and share your location, and to trigger an SOS alert and contact the GEOS 24/7 emergency response team. The comms device connects for messaging via the Iridium satellite network, with continuous worldwide coverage. Ex-Special Forces trooper and survival expert Bear Grylls has lived through many extreme conditions, and has the insect-eating-constitution to prove it. The Ultimate Kit is Bear’s go-to stash of tools for surviving in hostile environments. The 16-piece kit comes in a waterproof bag. Inside there’s a hand saw, fire steel, whistle, snare wire, waterproof matches, survival blanket and more. If you want an extra survival blanket, try the high-tech, US military-endorsed ReadyHeat Blanket or the versatile Snugpak Jungle Blanket, which doubles as a temporary shelter. The Bear Grylls Ultimate Kit has much of what you need to quickly set up camp in extreme conditions, and to help you catch and prepare wild food. There’s even a ‘land to air rescue’ instruction card for emergency evacs, plus a Priorities of Survival guide choc-full of Bear’s tips. Water and food, along with safe shelter, are among the highest priorities in extreme conditions. Drinking dirty water can make you incredibly sick. So how do you get access to clean drinking water when you’re deep in the jungle or waiting out a blizzard atop a mountain? Lifestraw Go. At first glance, the Lifestraw Go might not seem that high-tech. Don’t be fooled. This water filter uses advanced micro filtration tech to eliminate 99.9999% of bacteria and protozoan parasite cysts from water taken from wild sources such as waterfalls, streams, puddles and snow. The result? Clean water wherever you can find it, without risk of dysentery, diarrhoea or gut infection. Throw the Lifestraw Go in your backpack along with some high-calorie Seven Oceans Emergency Rations bars, and your basic water and food needs are sorted. Safe shelter is a must for surviving in extreme conditions – if there’s a storm rolling in, you need a shelter that erects pronto and stays up no matter what high-speed winds are hurled at it. 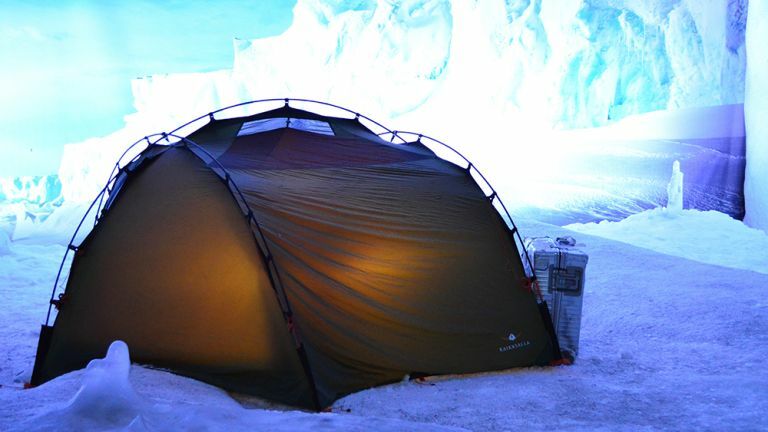 The four-season Mountain 25 Tent by The North Face will help you survive harsh weather. Compact, easy to move and fast to set up, this low profile tent can live on a variety of terrains. It even comes with four snow stakes for alpine situations. The water-resistant 40D nylon fly and canopy protect against rain, sleet, snow and hail. A fully-taped, cut-in nylon bucket floor lends additional structural strength to stop the tent from pitching in high winds. Want to see if the storm is passing? Look through the cold crack-tested (to -51°C) port window. Navigating back to camp in the middle of a blizzard, and all the while avoiding a ravine edge, is no joke. Equip yourself with this battery- and USB-powered 300 lumen headlamp and illuminate your way to safety. Black Diamond’s waterproof Revolt headlamp is geared up for nighttime missions. Not only is it super bright, it throws light in a wide arc so that you can see what’s immediately around you as well as in front of you. Multi-tools and survival go hand-in-hand. 17 genuinely useful tools are folded into The Wave’s rust-resistant frame, and all of which can be unlocked with one hand for fast access. Many of these tools are ‘outside accessible’, so you can use them when The Wave is closed. There are different types of pliers, two knives, a saw, scissors, can opener, a wood/metal file, and other essentials. The Wave is made from a high-carbon form of stainless steel and covered in black oxide, a powder-based coating favoured by the military to reduce tool glare that might otherwise give away your position. Essential if the extreme conditions you’re facing require covert movement. One day, Graphene will be everywhere in outdoor tech; infused in tents, hiking boots, helmets and anything else that needs strength and flex. Since ten layers of this lightweight material are more bulletproof than steel, think about how that could protect you in extreme conditions. Vollebak is currently developing the Graphene Jacket, a prototype that will be sold to the public. If it’s anything like the formidable Vollebak Condition Black Ceramic Jacket – a technical jacket so tough it can scar rock – it could well become the world’s next survival superhero.